316 Stainless Steel Heat Exchanger to inhibit microbial incubation. Control Panel in NEMA 4X Enclosure. The CWRS-90-UV recirculation system incorporates ultraviolet sterilizers and heat exchangers in 316ss as a means of effective microbial control within the pretreatment system. This degree of control is a crucial part of a USP purified water system and will contribute to trouble free validation. 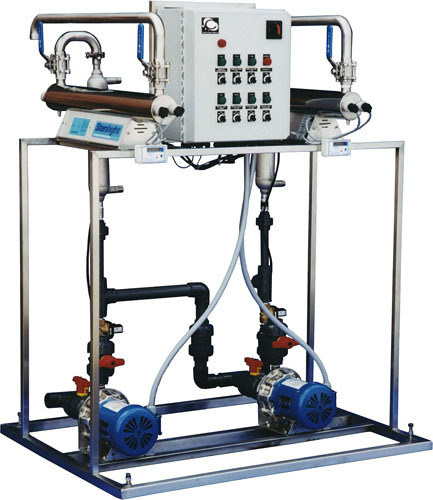 The system is sized according to the specific requirements of the water treatment system for which it is built.